It’s bad enough that Yahoo has made us blind or at least partially blind by hiding what other advertisers are bidding, but must they rub salt in our wounds by having us jump through hoops just to have a glimpse at the ‘Bid Range’? 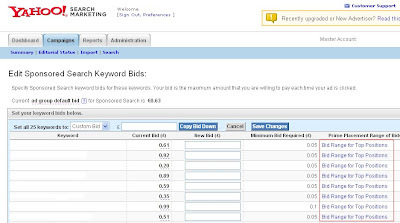 After navigating to a page where I can set bids, which is already a few pages deeper compared to the Pre Panama User Interface, rather than simply putting me out of my misery and showing what the range is under the column entitled: Prime Placement Range of Bids, I still have to click on each one separately in order to see the magic numbers. This is not user friendly nor is this an efficient use of time…. Enter the Dramarama as I am going to lose it. Cool write-up it’s actually. Friend on mine has long been awaiting just for this content.